Last season was a major step forward for the San Francisco 49ers, who advanced to the NFC Championship despite having a rookie head coach, no star wide receivers, and Alex Smith as QB1. Now they've signed Randy Moss to a one-year deal and maybe Peyton Manning will end up by the bay (though probably not). Point is, things haven't looked this optimistic for the 49ers in years. There's just one problem: Candlestick Park is a bone-chilling, depressing, horrifically constructed place to watch a professional football game. 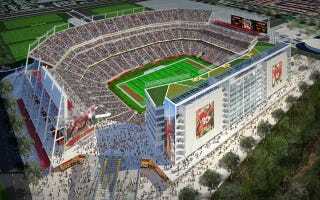 Good thing is, 49ers ownership is well on its way to fixing all that with a new stadium 40 miles south in Santa Clara. The bad news? It's a $1.2 billion headache that's pissed off local residents before even a single brick has been laid down. Even better, parts of the most recent cost increases aren't even based in reality. That's because $50 million has been allocated for technology that hasn't been invented yet. "This will be a cutting-edge, new-technology building because we're in the heart of Silicon Valley," said Larry MacNeil, the 49ers' chief financial officer. "We believe we need a significant budget to pay for things not currently on the market." We believe we need a significant budget to pay for things not currently on the market. That's just fantastic. Meanwhile, a few miles across the bay, the Raiders are stuck with the decrepit Oakland Coliseum until the ghost of Al Davis finally persuades local lawmakers to help pony up the money for their own new building, so hey, it could always be worse.